Over the Thanksgiving holiday we visited family who lives out of state. 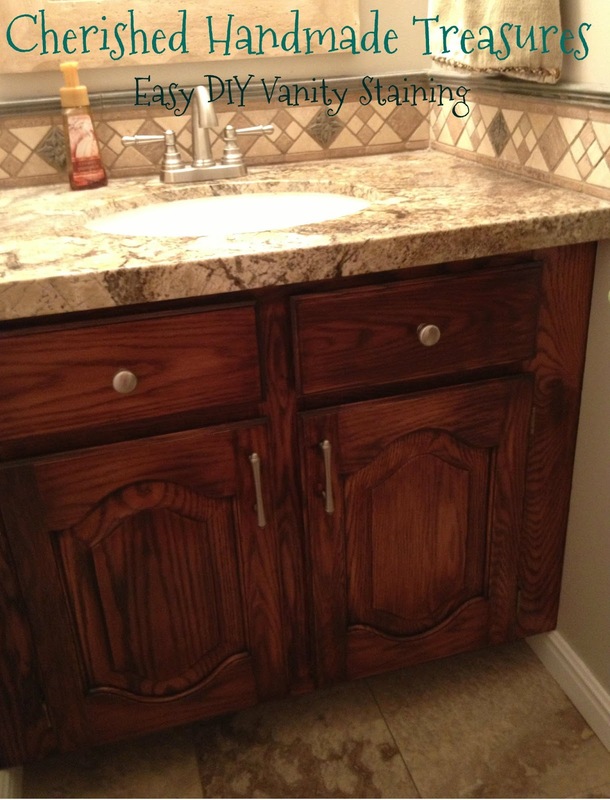 Our niece had recently refinished her bathroom vanity. And let me tell you it looked terrific. She had found a tutorial on Pinterest (who doesn't love Pinterest?). The woman had used a gel stain from General Finishes. My niece liked the way it looked and figured she had nothing to lose, so she gave it a try. My husband and I saw her completed vanity and loved it. We decided that would be the most budget-friendly way to update our wood--and best of all it sounded easy. Normally at this point I would just direct you to her tutorial, however, we did things a bit differently, so I’m writing my own instructions. 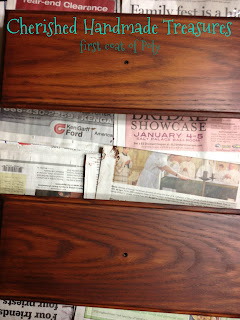 I have linked up my niece's blog post at the bottom of this post so you can see her vanity also. 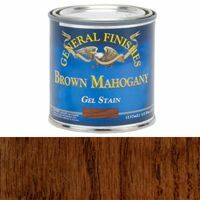 My niece bought her General Finishes Gel Stain online, but when we looked it up there was a store not far from us that sold it. So we decided to pay Woodcraft a visit and picked up several colors to play with and test on our wood. We chose four colors and then used the back of a drawer to do some test swatches. In the end, we decided on Brown Mahogany. 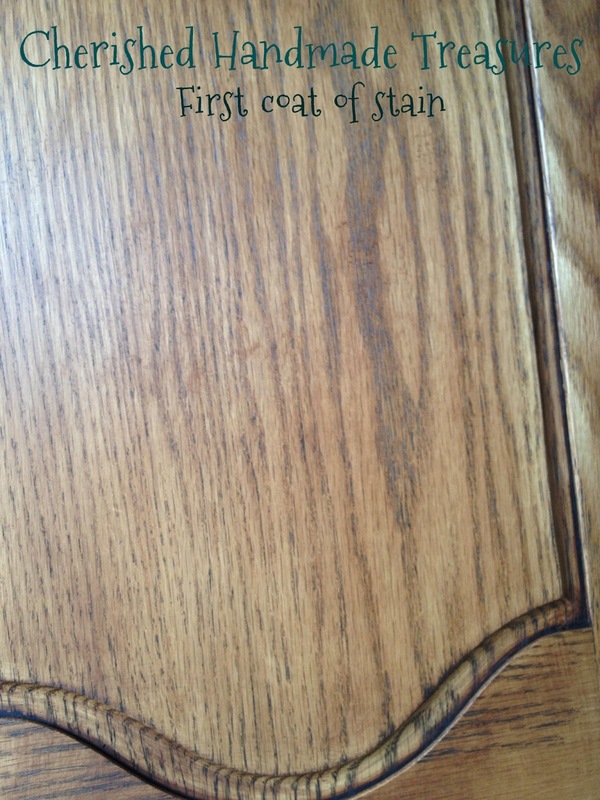 This was our original wood color. We have honey oak wood throughout our entire house, and we've wanted to change it for a while, but what a daunting task to undertake. But our powder bath vanity is small, so my husband was willing to try it. First tape off the area. Sand the surface, going with the grain. On the other blogs that use this gel, they suggest just scuffing the surface. My husband sanded the finish off our vanity. It took him about two hours for the entire vanity, doors and all. 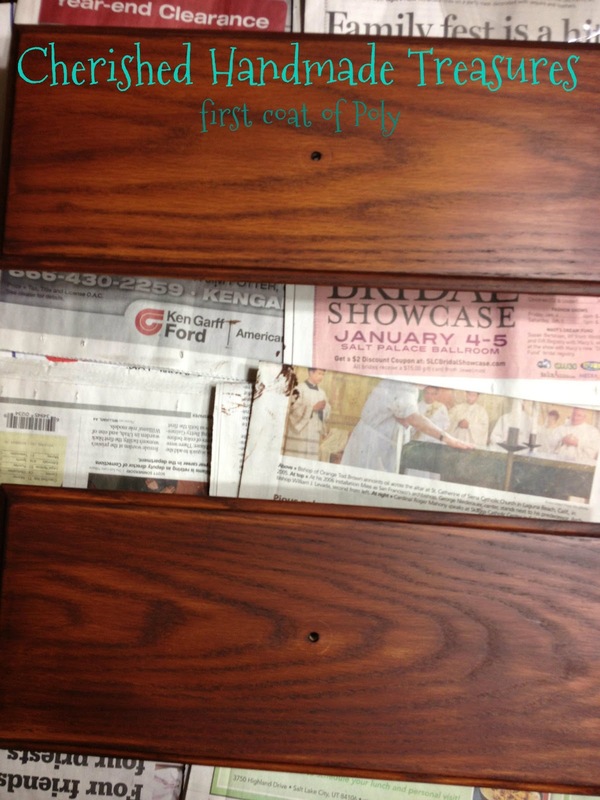 As I mentioned above, we used the back of a drawer to do some test swatches to pick our color. And when we just scuffed the surface we didn't feel we got good coverage--even with multiple coats. Then wipe it with a clean cloth. Use two white cloths (per coat) and a pair of disposable gloves. The cloths we used were like white T-shirt material. One to put the stain on and one to wipe it off. 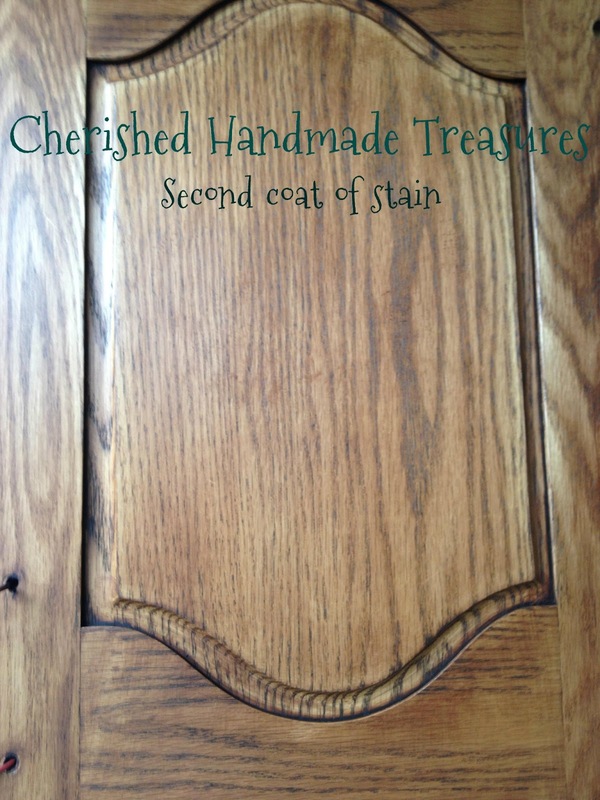 Go with the grain and be sure to wipe the stain in strokes from one side all the way to the other. You’ll notice there are no messy drips, runs or splashes-Yeah! That's because this is a nice thick, gel. It goes were you put it. Wait about 2-3 minutes and then with the second clean cloth wipe away any excess--smoothing it across the surface with the grain. Your first coat is not going to give you the effect you’re looking for--I doubt your second coat will either. But don't worry. You will achieve the color you’re after with additional coats. The difference between the second and third coat is amazing. This was where we stopped. Three coats of stain and two coats of poly. Drying time between coats: 8 hours for each coat. 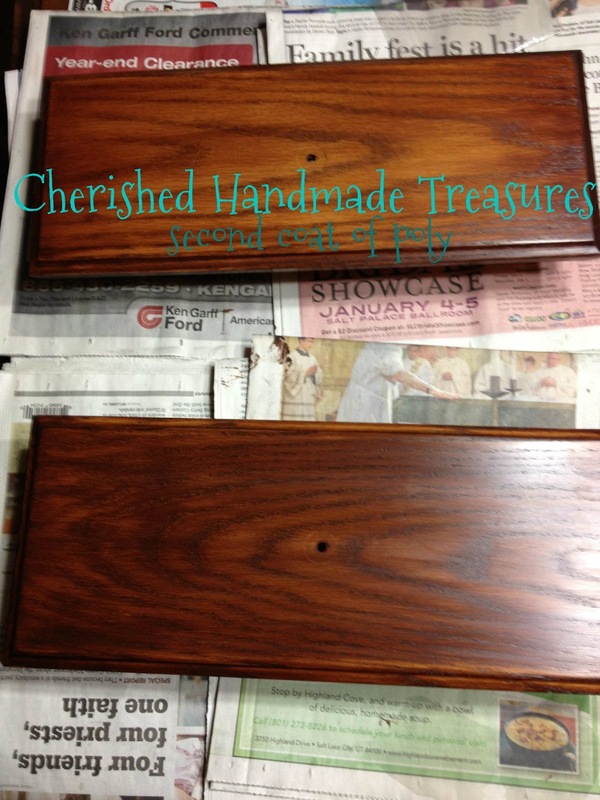 The salesmen at Woodcraft told us we could apply up to seventeen coats of Gel stain to a project until we reached our desired color. However, most people only use two or three. 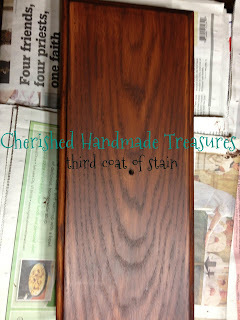 Also, you can use more than one color of stain. Making your own custom color. But they have a whole selection of colors to choose from. I read on other blogs that the Java color is the only color that works. 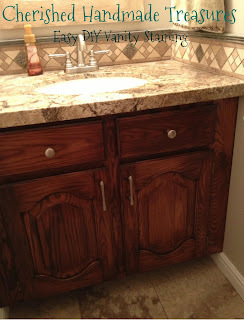 We used the Brown Mahogany and I love my new vanity. Believe me, these photos don’t do it justice. So I can attest to the fact that other colors do work. Thanks so much! The gel was so much nicer and easier to use. And the vanity looks so much better than the photos suggest. Thanks for stopping by. Wow, what a difference--looks great! It really is a huge difference. I wish I had taken a before and after photo, but didn't think about it until the work had already got underway. But I will employ him to refinish my kitchen cabinets and I will make sure to do "before" photos prior to beginning the work. That looks awesome!! I am so happy to see that other colors work well too! I am going to update my post so people aren't afraid of the other colors! I'm not sure I would have tried it, if we hadn't seen your cabinet first. It looked so great, we had to give it a try. i really like this. i need this. 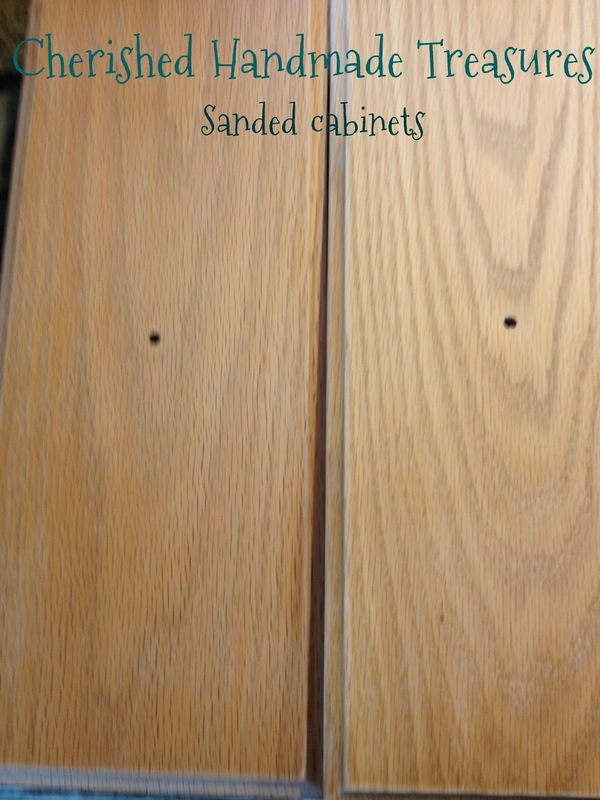 i have been wanting to refinish my cabinets and have been scared. thanks!!! Lovely! I wouldn't have thought a few coats would make such a huge difference. 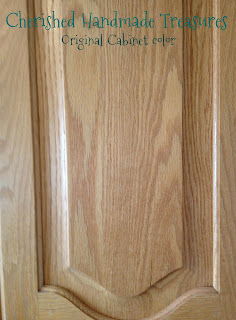 Maybe I need to give this a try on my cabinets. 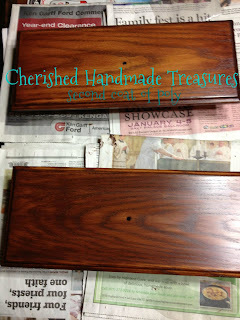 It was really amazing the difference between the second and third coat. We were pleasantly surprised with the results. We will definitely use this stain. 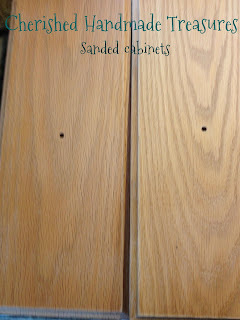 All of our cabinets need the color updated. 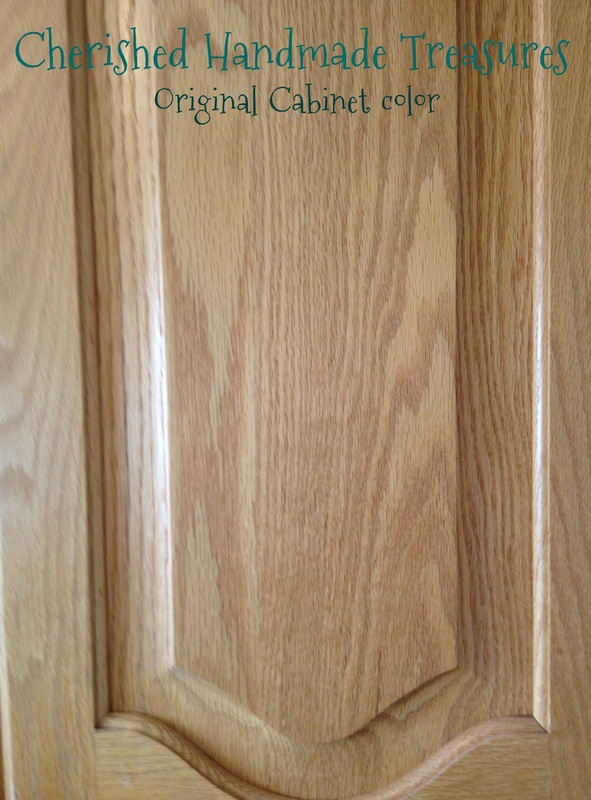 Love the new color on your cabinet! I've used several General Finishes products, and I haven't been disappointed yet. I have yet to try the gel stain though. It turned out great! After using this stain I will definitely try other products. Thanks! 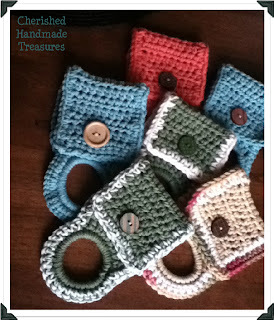 And thanks for visiting Cherished Handmade Treasures. Simply beautiful! 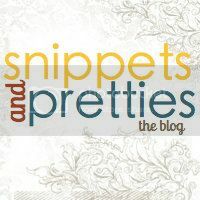 =) Thanks so much for linking up with us at the Pinterest Power Party! Did you brush this on, or rag it on? We used two white cloths (per coat) and a pair of disposable gloves. The cloths we used were like white T-shirt material. One to put the stain on and one to wipe it off. 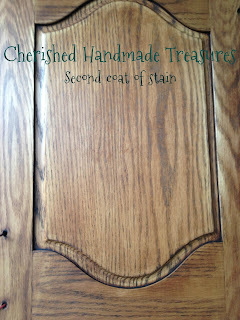 Go with the grain and be sure to wipe the stain in strokes from one side all the way to the other. You’ll notice there are no messy drips, runs or splashes, because this is a nice thick, gel. It goes were you put it. Wait about 2-3 minutes and then with the second clean cloth wipe away any excess--smoothing it across the surface with the grain. What kind of top coat did you use? The General Finishes Gel Based Urethane Topcoat. I have added a photo of the can above. Did you do anything after the last topcoat? Like buff it out? If so, would you mind sharing what you did and technique? Thanks! We didn't do anything more than what I have listed above. 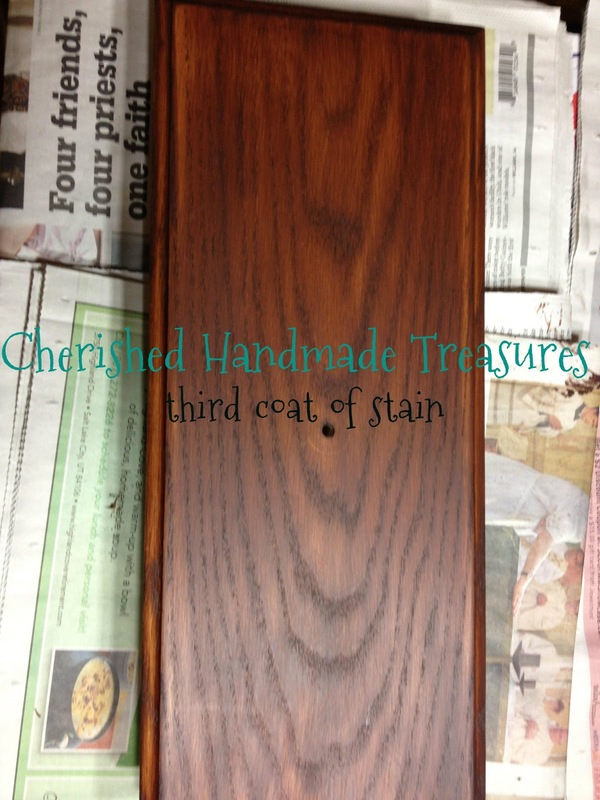 3 coats of stain and 2 coats of the gel topcoat and allowed each coat to dry completely between applications. That's it--no buffing.